Opening times vary, so give us a call before dropping by. 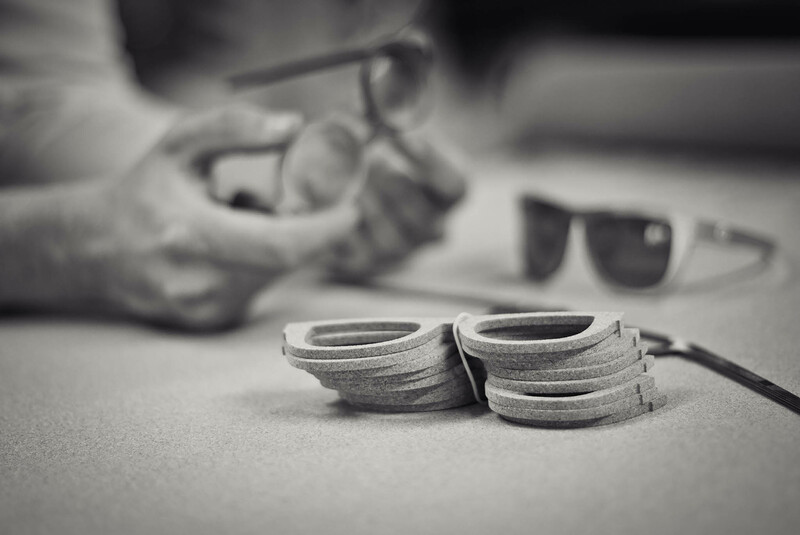 Kraa Kraa is about making great eyewear. We make eyewear that fits and we do it with style. Our frames are a blend of open-minded design, modern craftmanship and uncompromised quality. All our frames are handmade in Tampere, Finland. If you can't find an answer to your mind-boggling question here, email us at info@kraakraa.com. We have answers to pretty much anything. My Kraa Kraa frame feels great, why? Our aim is to make frames that work well without compromising the look. Our frames are light, springy and have an optimal center of gravity. Most of our frames are one-piece, which makes them especially lightweight and pleasant to use. Kraa Kraa's FIXIE frames have a layered wood veneer structure, which is for example used in skis and bows. It's flexible but has the tendency to return to its original shape. This results in a snappy fit and the frame will stay in place, without sliding down your nose. The COPY ROOM frames, which are part of the WHAT ELSE collection, have a lighter feel. Wooden nosepads keep the frame balanced on your nose while the steel temples wrap gently around your head. What kind of customisations are possible? All Kraa Kraa frames come in several sizes, styles and colors. The frames are designed for everyday use and they are adjustable to suit your facial features as well as optical requirements. The FIXIE collection is our most versatile collection. With the possibility to choose between several frame designs, colors, sizes and bridges to fit your unique style and needs, you're likely to find the frame of your life from this collection. There's over 10 000 combinations available in this collection. When in need of something truly unique, we also design one-off frames to suit your personal needs and desires. Can a wooden frame be adjusted to ensure an optimal fit for me? The frames can be adjusted by an optician if needed. However, this is seldom necessary, since the temples of Kraa Kraa frames are designed to rest firmly against the skull. Even having ears at different levels doesn't usually affect the fit. Kraa Kraa frames are made in several sizes to accommodate all kinds of faces. The squeeze of the temples of course depends on the shape and width of your head. Besides the size of the frame, the squeeze is also affected by the frame design – the wider the temple, the tighter the squeeze. The springy structure of Kraa Kraa frames is snug but flexible. As you use your frame, it will adjust to your features within a couple of days of use. After a while it should feel like wearing nothing at all. What kind of lenses can I have in my Kraa Kraa frame? We recommend good quality plastic lenses chosen for you by an optician. If you prefer glass lenses, they can be fitted in Kraa Kraa frames as well. All our frames can be fitted with either clear or tinted lenses, with or without optical corrections. Both single vision and bifocal lenses suit Kraa Kraa frames just as fine. Can any optician fit lenses on a Kraa Kraa frame? Yes. A professional optician will know how to fit the lenses. If your optician isn't familiar with Kraa Kraa frames, you can ask them to contact us and we will be happy to provide them with all the information they need to get the fitting done correctly. How do I take care of my wooden frame? The frame can be washed with warm running water and mild soap. For cleaning the lenses, you can use the microfiber cloth that comes with the frame. It is important to avoid using hot water or alcohol-based lens cleaners, because they might wear down the frame's finishing. Does the color of a wooden frame change during time? Some woods turn darker, some lighter. Also, the dyes used in coloring the wood can be affected by light. The changes are usually not dramatic, but for example the blue color doesn't tolerate UV-radiation as well as the others. The surface layers of colored Kraa Kraa frames are tinted with non-toxic water-soluble dyes. If the finishing is worn out and the frame is subject to mechanical stress when wet, they might lose color. Especially blue, red and green are prone to this. This is not an everyday problem, but for this reason we don't advice choosing a dark color for the inside of the frame. I have oily skin. Can this cause changes to the frame? The areas of the frame touching or near your skin might darken with use. These changes are always individual, depending on the original color of the frame as well as the oiliness and pH-value of your skin and the conditions where the frame is used in. The darkening doesn't affect the use of the frame, but of course it might be an aesthetic disadvantage. The quality that makes Kraa Kraa frames light and comfortable is the porous cell structure that wood itself has as a material. Kraa Kraa frames have a natural wax finishing that protects the frames from oils, sweat and dirt from the surroundings. The finishing has been thoroughly tested both in laboratory and real-life conditions. It makes the frames suitable for everyday use, but it cannot yet preserve the frames as new for ever. What if my Kraa Kraa frame needs repairing? Our frames are handmade by us, so we also know how to repair them. If your frame has been in use for a couple of years and the finishing needs renewing, if you accidentally sat on your frame, if your dog bit the temple off, or whatever else the problem might be, contact us and we're happy to help. What's the price point of Kraa Kraa frames? The prices of Kraa Kraa frames start around 500 euros. The price of a frame depends on the collection, the chosen materials and possible add-on features. I've seen wooden frames that cost half as much as one of your frames. Why are your frames so expensive? Because you get what you pay for. Many eyewear brands go through catalogs of some anonymous factory, choose a frame model that some engineer has drawn, and order them in bulk to sell with their own brand logo. They might call this design, we don't think it is. Our frames are the result of our own long-running product development, which has resulted in superb quality. Our frames are often made to order, which assures their perfect fit and personalised style for each customer. We also design and manufacture our frames ourselves here in Finland. We have filed, sanded and finished each Kraa Kraa frame by hand. You're welcome to come and visit our dusty workshop in Tampere to see how it's done. Why don't you get your frames made somewhere cheaper and make better sales? Because it's not the right way. Making things locally is sustainable, no matter whether you look at it from an ecological, ethical or economical point of view. Is there anything else I need to know about Kraa Kraa frames? Wood is a natural material. Every piece of wood is unique and there are always slight differences in shade and texture from one frame to another. A wooden frame also ages uniquely. Like leather, with the wear and tear of normal life, your frame will get an even more personal look and patina to them. A lot of our customers also tell us that after getting Kraa Kraa frames they can no longer walk the streets without strangers coming up and asking about their eyewear. So be prepared. Finally, the BIG question. Where does the name Kraa Kraa come from? It's the sound that crows make. Clever little devils. We design and manufacture eyewear.